The dark silence on the Delhi-Gurgaon highway at 8pm was intimidating.We knew,our dad's small and old but sturdy Maruti 800 had given up midway.In the middle of thoughts on where to go and how to reach our next destination "Chandigarh",we had weird unrealistic dreams as ray of hope of being part of TV crew and asking for random hitch hikes along the way,the kind of they show in Reality shows.But what about our car,the beloved car we were in for last 8 days covering the west of India.How can we leave it alone?The car was my dad's first love,and my brother's passion.The car which was destined to cover the All India what may come.And so with our respect for our car,we started looking out for ways we could get on to the next Car repair center.Unfortunately there weren't any,but we found an angel in one of distant aunty's distant inlaws place in the interiors of Haryana.Our beloved car was tied with their jeep and there we went in another. "Kaha se ae ho?" - asked the elder member of the family,just before I could complete ,my brother said excitingly "Bangalore and on An All India Road Trip" and repeated it again "on a road trip,and we need our car tomorrow to proceed further to the Himachal and the Punjab".Our faces at that time resembled the innocent cute little sheep's asking for help and he said "In the morning I'll get the car done but do not forget to have the breakfast made from fresh produce from our fields".That night we slept peacefully in a village unknown all excited about what may lie ahead and cherishing the memories we left behind. The memories which was part of our dream to just go for our nomadic sojourn.Both of us,bored of our 9-5 regular jobs,decided to call it quits and indulge in a crazy roller coaster drive from Bangalore to Jammu and then back to Bangalore again covering first the west of India and then the central part of India in 18 days flat.We had already covered the east and part of north east in another short road and train journeys before.We wanted to escape.May be fly.May be touch the skies on the roads.So I called up my brother and..
Anki:Hey wassup dude,are we going on the run? Gaurav:We are leaving tommorow,4 am suits you? Gaurav:It's 11 hours dude to Pune,and you know our Maruti right,we got it after a little old fight with Dad? Gaurav:Cameras,ok by the way did you receive your Air Force Admit Card? Cummon don't bore me with exams and results,ain't we off to something more adventurous now! We started off for our first long drive the day 1 from Bangalore - Pune covering nearly 900 kms in a day.We didn't even stop at the highway food joints,we carried our own food.Yes,the food some call snacks "the Kurkures,the home-made sandwiches,some nuts".But for us it was usual stuff.Me and my brother are born nomads.The trend runs in the family.From my dad's transferable job to my mom's chilled attitute we have always been on the move since childhood.But now our thirst for discovering places was growing at such at infinite rate that we no longer wanted the local around the town travel but something big,really big.The tunnels and we knew Pune was around. Next day we took a quick stroll in Pune and we were off to our next destination Mumbai.After Mumbai came Daman.While Mumbai was humid and hot, Daman was burning with Scorching heat.Gujrat smiled us at Surat next.We visited the famous temples and did some shopping.Next was Vadodara.South east of Ahmadabad is the artificial Kankaria lake, which was near to where we stayed. We visited the temples, Kankaria Lake and the local markets. Next day we had planned to reach Ajmer by the evening. We had two choices, to go via Udaipur or to go via Chittorgarh,we chose Udaipur route as it was more popular.The city's famous Lake palace sits proudly on Jal Niwas or Lake Pichola.The palace was splendid. We clicked some photographs and then proceeded towards Ajmer and reached there in the evening. Ajmer is famous for the Ajmer Sharif dargah.We visited the Dargah and with the confirmed blessings from the god,chose to move ahead. Next morning, we went to Pushkar which is only half an hour from Ajmer city. It is a famous place all over India for its fair as well as the numerous temples. It has the only Brahma temple in the whole country. After visiting some of the temples, we started for Jaipur. Jaipur is bursting with forts, museums and palaces. Famous for the Bandej sarees, we explored the city as much as we could and from there we took the road to Gurgaon and that's where our real journey started.Stuck in the middle of Haryana,Village all around, unperturbed by beeps and honks, simple people and great food we were enjoying the untold unplanned adventure.Next morning I had pure dhud(milk) and freshly prepared vegies from the khet with the ghee roti.I wish I could stay there forever,but just then I heard him "Gadi thik ho gai hai,you might leave".After giving quick and sweet hugs to the villagers for their kind hospitality,we left for another adventure. Since we had wasted a lot of time driving in Haryana last night,we thought we would bypass the main Gurgaon highway and just follow what google map suggests now "The Jhajjar-Rohtak-Sonepat-Panipat route".What we didn't know that there was a flood in Haryana a month back,and what we didn't know what the condition of roads that lie ahead of us.The natural disasters in India as we all know takes exceptionally long time to heal,and so with the happy-go-lucky attitude we started off with putting one tyre on the relatively smaller hole and another on a little pakka road.Splash splash..a little left a little right left right left right it looked like the game of terrible maze.The bumpiest 10km drive which took us more than an hour.And this wasn't all,the usual Delhi-Chandigarh if done by normal route which takes 4 hours,took us 10 hours travelling in the interiors of water clad Haryana.But now when I look back,It was the most interesting route we had ever drove on. Punjab is quite synonymous with Amritsar for the golden temple and Chandigarh for the rock gardens. For us, we just spent a couple of hours driving around Chandigarh and then we started off for Amritsar.Covering Ludhiana and Jalandhar was on our wish list too thanks to DDLJ,and Punjab didn't leave us disappointed. The icing on the cake was the visit to Wagah border to witness the ceremony and I was completely overwhelmed , it’s a feeling I cannot describe.We shouted out loud,our tones on patriotism reflecting in our actions.The moment which can only be felt and just cannot be put into words. Next was our drive to Dharamshala and Palampur.The view of the hills along the route is very beautiful and for some time, we felt like we were in heaven. Unlike other hill stations, the road leading to Dharamshala is very very narrow and a very steep climb.Dharamsala is untouched by commercialization hence the beauty is intact. Our next destination was Manali. A special thanks to the Indian military which has built up a long tunnel which has shortened the journey to Manali by about 50 kms. One of the very interesting feature about this trip was the hills on one side and the free flowing river Beas on another with many waterfalls en route. Every scene was picturesque and we clicked as many pictures as we could.Shimla Tattapani hot sulphur springs was on the Manali- Shimla route,famous for the healing properties of water and we enjoyed going to the hot springs as well. Mall road is the lifeline of Shimla and we absolutely loved our experience walking down the mall road. Just around 1 and a half hour drive from Shimla is the famous Naina Devi Temple located on the hillock, the road is steep and we got lucky that our car didn’t break down in between. We visited the temple and started our journey towards Delhi. Mathura, a little town,birth place of Lord Krishna comes in the way of delhi-agra road. After visiting Hari Krishna Janm Bhumi , Vishram Ghat , Dwarkadeesh Temple , Gita mandir, Nidhivan , Seva Kunj and Banke Bihare Temple and crossing fatehpur seekri near Agra,we reached Agra. Agra is famous for Taj Mahal,and it truly deserves the title of "one of the seven wonders of world”. When they say "Taj one of the seven wonders of world"
I count myself "The Eighth"
At Jabalpur,we took the cable car over the Narmada River at Bhedaghat from where the bird’s eye view of Dhuandhar Falls and Marble Rocks is amazing. We also did boat cruise at bhedaghat. Of all the road trips we have taken so far,this route is one of the best and most scenic. With flowers alongside the road, the route took us by surprise.Next we went to Nagpur ,Lata mangeshkar musical garden at Nagpur is a landscaped garden and lawn. The garden also has the musical fountain. Next was Hydrabad,as we all already know Charminar is a major landmark of Hyderabad which we cannot ignore as the monument is situated right at the heart of the city.We started off from Hyderabad next morning to Bangalore. And now when we are back in Bangalore,we know we had the best times in 18 days covering more than 8000 kms.What made it worth was it was done on a 13 year old non-AC MARUTI 800 in October when parts of the country was burning almost(specially parts of Rajasthan,Gujarat,Daman and Madhya Pradesh were horribly hot) and not some flashy SUV.It was the most memorable journey of our life and with the stories of puddles and cuddles above,you must be now knowing why. "The adventures" were unpredictable,the roads inescapable the cows adorable and we as usual on our own vagabond self.Our journey was also covered in Outlook Traveller last year,a journey of two crazy minds,my brother(the driver) and me(the inspiration). 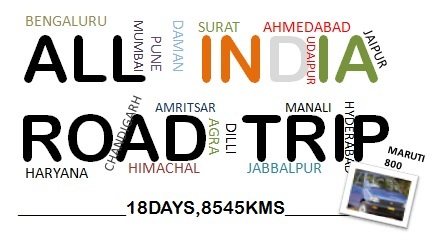 I love travelling because err "I love it because sometimes in life you fall in love and then you have no control over your desires.Travel makes my heart go skipping and we share an intimate bond of absolute fondness for each other.My funda in life "22 tak padhai.. 25 pe naukari... 26 pe chokri... 30 pe bacche.. aur 60 pe retirement aur fir maut ka intazaar.. . . . . . dhatttt yesi ghisi piti life thode hi jina chahta hu.If my thoughts resonate the upcoming lines from the movie trailer "Ye Jawaani Hai Deewani" don't be surprised I can give a tough competition to the sweet and charming Ranbir. Did engineering,left engineering,did a job,left a job,started a travel adventure blog and now travelling like mad to places I have had only dreamt of before.Some don't believe I was a techie in my past year. Why I love travelling is because I love the change,the people I meet,the uncertainties and the surprises,sometimes crazy sometimes bizarre but they all in all make great stories.The basic reason we all travel is we get bored of Mundane,and we go out in the open to restore our balance of mind and soul.My inquisitive soul looks out for challenges every time I travel " I backpacked Maldives because I was like hey why people just go there as a honeymoon couple,can't it just be explored like any other country,I covered Bihar because I thought It can't just be so boring as people say","I tried Microlight flying because I loved planes". Why I travel is I find the imbalance in me very often,there's a thirst in me which gets fulfilled with a new destination every 2 weeks.I cannot define it,some people are balanced I am not.I find balance.I sometimes like sand sometimes sea,sometimes just strolling around.Change of place,change of friendships,change of funny little things to do and weird things to eat excites me.I love to follow my heart and my nomadic heart takes me places very often and sets me free with every journey. The journey in itself is worth living for,and what makes it worth more is the puddles and the cuddles along the way. Superb.. love the zest and the zeal..